I'm Chris, a stand-up comedian. 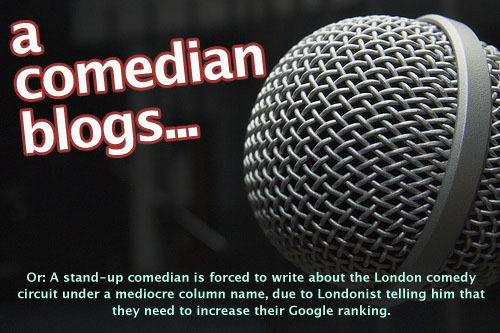 I'll be blogging once a week about fun or interesting gigs I have, or just to give my opinions on the London comedy scene. As it happens, I'm very good at opinions. I've got at least three at the moment, and I'm hoping to have a couple more by the end of the year. If you enjoy my column, why not try making a game out of spotting the opinions? Give yourself a point for every one you find, and comment on my entries to tell me how many points you have. The person with the most points will win a new hen! I've been doing stand-up comedy since November 2006. I've loved comedy since I was a kid, but one day last year I got horrendously drunk, and decided that it would be a good idea to give it a go myself. I'm also a massive comedy geek, and I figured that doing stand-up would be the best way to make friends with some of the people I most admire. Or at least, it seemed more likely to succeed than my previous idea, which essentially involved turning up at Stewart Lee gigs, offering him a cake with icing that read "PLEASE LOVE ME!!". My stand-up isn't very mainstream. I like talking about things that are silly, surreal and playful, though sometimes I'll be satirical and offensive. It's mostly nonsense, but occasionally I use words like Trotskyist, so some people incorrectly think my stand-up is clever. If you read a few of these blog posts, you'll soon find out how deeply wrong they are. I like doing things that make other people happy, so I make magazines to give to people who like my act, and I give out badges and cake for free at my new comedy night, The After School Club, which runs twice a month in Camden. I'm going to try my best to write articles for Londonist that will make people happy, too. I was invited to write for Londonist after they received the press release for The After School Club. I wasn't going to tell the press about it, because it felt awfully boastful. So instead, I made a MySpace and added anyone I could find that lived in London, and liked Lee and Herring or The Mighty Boosh. Everything was going fine, until a man from the Gay Times mailed me to enquire about press tickets and my press release. I was actually quite worried, because I'd feel guilty if I replied saying "I'm sorry, you've mistaken me for someone that knows what he's doing". Luckily, the chap helped me knock up a great press release, which I swiftly mailed off. Ben was kind enough to write a glowing promo article. As it happens, he's also been secretly reading my blog! One thing LITERALLY led to another, and for reasons entirely beyond my understanding, the team asked if I'd be interested in doing more of the same for Londonist. So, here I am! I live for feedback, so please don't be shy to comment on my articles, even if it's just to say hi. I look forward to telling you about my adventures!